Once applied to the concrete a chemical reaction happens producing a color change in the slab. Because the stain reacts differently to the different parts of concrete you will not get a solid color or even reaction. This will give a really cool weathered stone, slate or mable look to your concrete. After the stain is applied to the concrete and dries, it is cleaned up and then a selant is sprayed. There are several different types of sealants that dictate the final appearance of the acid stain. For exteriors, you can use a sealant that has a sand like material in it that prevents slipping. Although you do not get the textured stamping of stamped concrete you do end up with a wide variety of coloring. The coloring options for stained concrete is much greater than your options with stamped concrete. Acid staining is not a coating or layer on top of the slab it actually becomes a permanent part of the surface so it will not flake, chip or peel either. Besides offering a unique coloring, acid staining is also more affordable. Typically it is $3-4 cheaper a square foot than stamped concrete is for a new pour. You also have the ability to acid stain exisiting slabs as long as they are in good shape which makes it attractive to a home owner with an existing patio. One negative to stained concrete is the amount of time you have to wait to stain and newly poured slab. In order to Acid stained concrete, it needs to completly cure or dry out which takes up to 28 days. 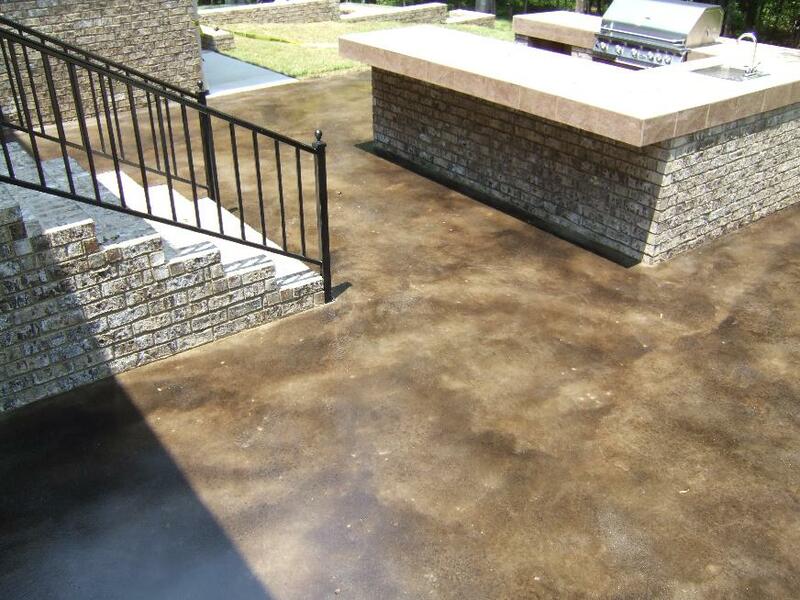 Stamped concrete is applied immediately to a poured slab and can be used a few days later.